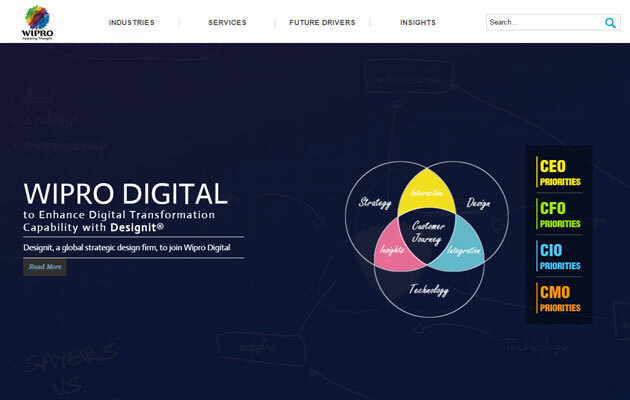 Wipro Digital, the digital business unit of Wipro Limited, said it will buy global strategic design firm Designit, for â‚¬85 million ($94 million). The purchase consideration includes a performance based contingent consideration payable over three years and the final payout could range between 70-105 per cent of the purchase amount. Founded in 1991 in Aarhus, Denmark, Designit has become one of the world's largest, privately-held design firms. Employing more than 300 people in nine offices globally, it delivers product-service experiences for some of the world's top brands in healthcare, telecom, banking, automotive, and retail. The company had revenues of â‚¬27 million ($30 million) during 2014. "Our clients are looking to us to help them transform their businesses and move at the speed of digital. Solving these complex challenges starts with strategic design and fuses a human-centered method with innovative technology solutions delivered by multi-disciplinary teams of strategists, designers and engineers. With our acquisition of Designit, we will complement the capabilities of an established design leader with our engineering heritage and bring compelling value to our clients," commented Rajan Kohli, senior vice president and global head, Wipro Digital. "Designit offers a unique opportunity for us to bring together capabilities not often found in the design industry including scale and global reach, a Scandinavian heritage and innovative, award-winning client work. Designit has also developed a unique open, creative and collaborative culture that we intend to nurture and grow," he added. Mikal Hallstrup, founder and chief visionary officer, Designit, said: "Design is no longer about beautification. It is about creating a strategic foundation, driving growth and change across industries. There's an endless market for products, services, and systems that need to be simplified and humanized. With Wipro Digital, we can deliver as big as we can dream." The acquisition is subject to customary closing conditions and regulatory approvals and is expected to be closed in the current quarter. This is the first inorganic expansion move by Wipro this year. Last year it had acquired ATCO I-Tek, an IT business of Canadian firm ATCO for $195 million in an all cash transaction. It has, however, also invested in other tech ventures and startups.